DO YOU WANT TO BECOME OUR NEIGHBOR? 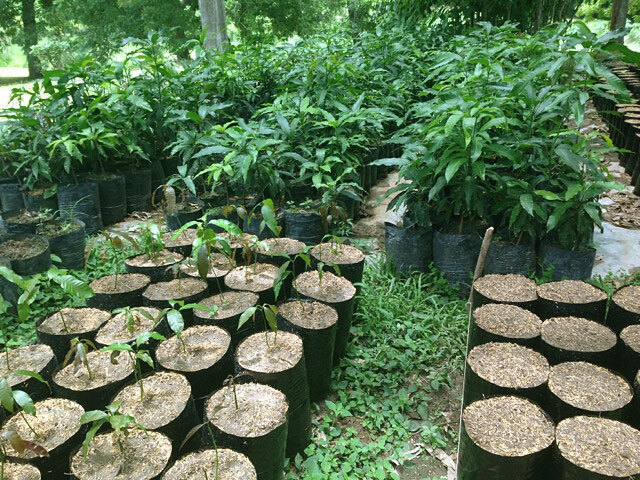 We are receiving so many questions from you about our Mango Farm that we decided to make a trip to the farm last week to give you an update. The Mango harvest is completed, the sweet taste of mangoes is in our memory and not part of our breakfast for some time now. Unfortunately, there is nothing to replace the sweetness and juiciness of a Mango. You just have to resign yourself to different fruits with different flavors. 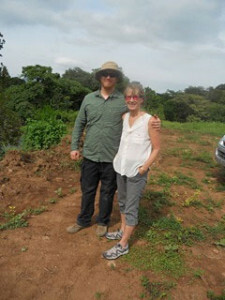 So, we rounded up a few people here in our neighborhood…farm owners and visitors from Europe and the United States…to make the drive from Gorgona to the farm, which is about 20 minutes west of the town of Penonome. Total driving time for us is 1.5 hours on the TransAmerican Highway. 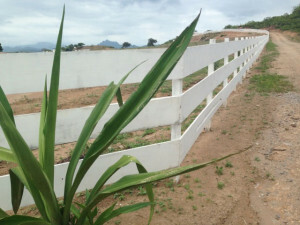 The access road from the highway to the mango farm is a well-maintained blacktop road approximately 6 KMs through wonderful farmland (rice fields) toward a beautiful mountain range. Soon we see the white wood plank fence in the distance, distinguishing our property from all the other farms in this area. At the entrance to the farm, we take a dirt road which leads to the shop area. We picked a great day to visit. There is activity wherever we look. People are busy planting seedlings in the ground. Others are doing landscaping to stabilize the slopes. Still others are clearing more land. 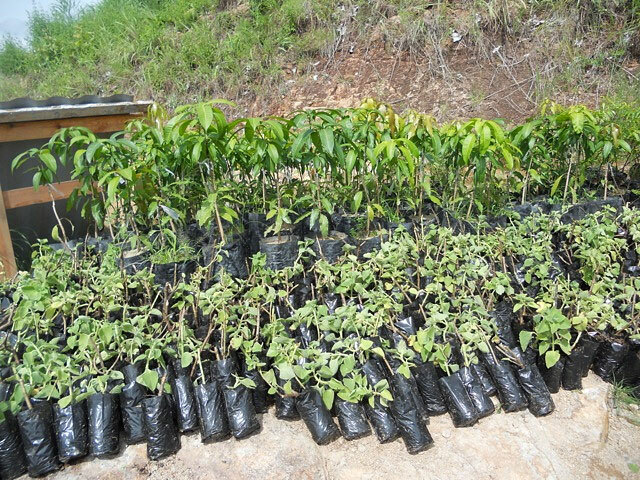 The mango seedlings come from the nursery in San Carlos, where they were crafted to produce the wonderful Lady Victoria Mango. 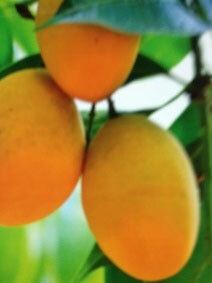 The Lady Victoria Mango has been developed by our management team over the past 15 years and has an 85% fruit to seed and rind ratio, a higher yield and a strong resistance to pests, fungus and bacteria infestations in tropical climates. In the following photo, you can see the seedlings at the farm ready to be planted. 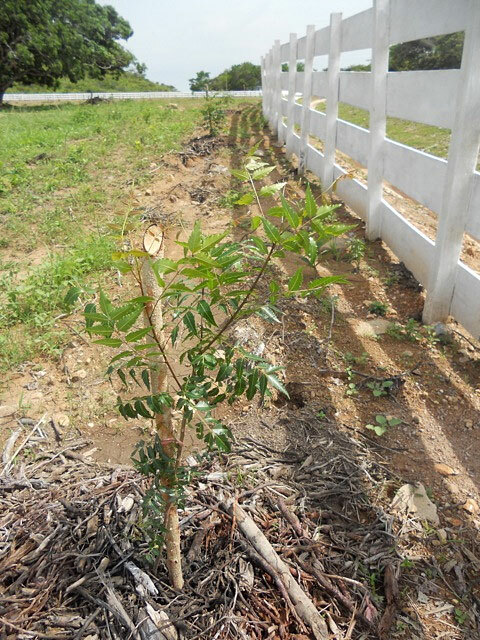 The seedlings/trees will be planted at a distance of 15 meters from each other. The planting is a very sophisticated procedure which includes natural fertilizers developed by the team and exclusive to the products this team grows. Our Mango Farm produces only ORGANIC Mangos and other fruits & vegetables. NO chemicals! 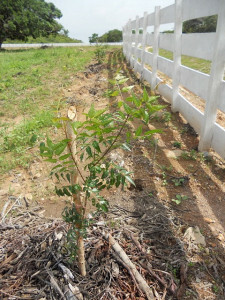 To protect the trees and the fruit, there are Neem Trees planted along the fencelines. These trees are known as “nature’s pharmacy.” They keep harmful insects away from trees and fruit. There is a lot of vacant space between the trees in the early years. In order to utilize this space and to increase income in the first few years, we will be growing oregano and guandu (pigeon peas, very popular here!) between these trees. These products have multiple harvests per year. This picture shows Norma with Alan, the president of the development/management team. If you notice Norma’s smile, it’s not just because of the company. It’s the pleasure of seeing how well this farm is developing..after all, it is a big part of our future retirement! Let me now answer some of the most popular questions about the financial part of the venture. Yes, it is still possible to become an owner. No, the profits are not taxed in Panama, up to an annual income of $300,000 per year. No, there is no Real Estate Tax due for up to 20 years! 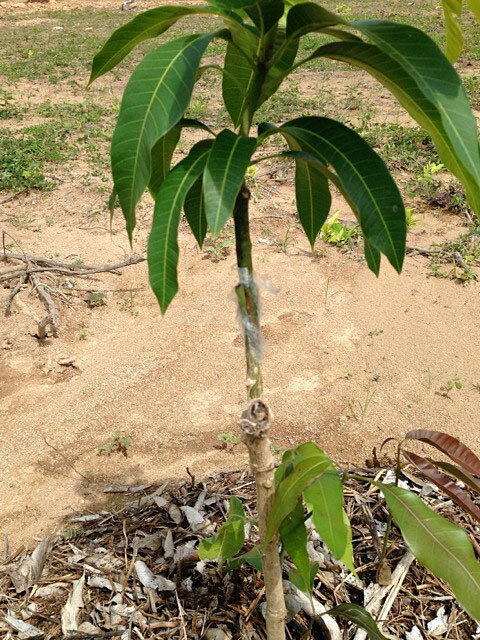 The mangoes will be sold in Panama and for export. The largest US fruit importers have spent a lot of time at the farm trying to secure long-term contracts for the entire production. Yes, this is profitable! All calculations are based on the sales price on domestic market from 5 years ago. We will be happy to send you detailed financials, on request. Yes, this is very affordable. Less than $40,000 currently will make you a partner owner. This investment is a real estate transaction, not a sale of shares, stocks, etc. A deed of trust certifies your ownership. Besides income from the fruit, we will have appreciation of the land value as well! Send me more of your questions! Sweeten your retirement with juicy mangoes!